What sorts of roles are available in social housing? What can I do after the GEM Programme? Incommunities’ award winning graduate development programme is going international as two Canadian housing officers join its latest group of recruits. The Bradford-based housing group is launching cohort 9 of the GEM Programme – Graduate Employment Mentoring programme – with a two-day induction (Thurs – Friday) at the University of Bradford’s Heaton Mount centre. The GEM programme is run by the Centre for Partnership and aims to fast track graduates that show leadership potential and strong social values into exciting careers in housing. Cole McNamee and Nicole Han become the first overseas graduates to join the blended learning programme, taking their place with 24 students from across the UK. They work for Capital Region Housing, which manages nearly 5,000 rented properties in Edmonton, Alberta, Western Canada. Cole and Nicole were put in touch with the Centre for Partnership after their Chief Executive (Greg Dewling) attended a presentation by Geraldine Howley on the success of the GEM programme and wanted to get involved. Nicole Han said: “I am a firm believer in snapping up an opportunity to learn and grow. Cole McNamee said: “Coming to the UK and Incommunities is a fantastic opportunity and when I heard about the GEM programme at work I wanted to apply straightaway. “I have only been working in social housing for a short time and I’m particularly keen on the mentoring approach to advance my learning. The programme also welcomes for the first time two recruits from the Northern Ireland Housing Executive and five from the leading construction company, United Living. During the two-day induction, everyone will meet tutors and mentors from partner organisations as well get first-hand experience from previous GEM students of the value of the programme. A host of housing associations and related organisations are providing paid one-year placements as part of the programme. They include Incommunities, Contour Homes, Orbit Group, Northern Ireland Housing Executive, Regenda Homes, Salix Homes, South Yorkshire Housing Group, Thurrock Council, United Living and the Glasgow-based Wheatley Group. The GEM programme is accredited by the Chartered Institute of Housing (CIH) with students studying for a Level 4 qualification as well as taking part in intensive personal and leadership development activities. Recruits are joining a programme that gets results. Over 95% of GEMs completing the programme secure jobs. Nearly one-third of GEMs now working in housing are from BME backgrounds and two-thirds are female. Incommunities Group Chief Executive, Geraldine Howley, said: “The GEM programme goes from strength to strength expanding from a local venture seven years ago into a UK wide programme that is now attracting international recruits. “We are delighted to welcome Nicole, Cole and all our new partners and their GEMs onto this exciting programme where they can really make a name for themselves and build rewarding careers in the sector. “All our new GEM recruits will meet for the first time this week and be given an insight into how the UK social housing sector has evolved as well as look at the challenges it faces today. Trevor Smith, Director of the Centre for Partnership, said: “It’s really exciting to see our strategy for GEM expand into the construction sector and our growth geographically become a reality this week. “We will be forging more international partnerships whilst we are delivering this programme as we know housing is a global issue which requires a pipeline of talented graduates to meet the challenges of the future. 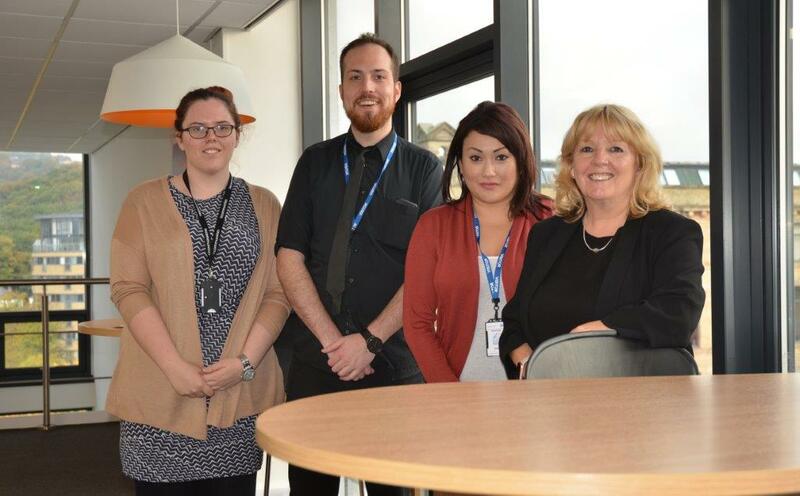 Pictured – Cole McNamee and Nicole Han with Geraldine Howley (right) and Georgina Uttley (left) from Incommunities’ Centre for Partnership Team. Incommunities Group has over 22,600 homes in West and South Yorkshire. Incommunities is the biggest social landlord in the Bradford District and the Huddersfield-based Sadeh Lok is a traditional BME Housing Association formed in 1988. For more information on the GEM programme and how to apply online click www.centreforpartnership.co.uk/the-gems/ or ring 01274 254701.